Ever wanted to date an Alien? Ever wondered what it would be like to experience some Extraterrestrial flirty-feels of your own? Well, you are in good company. It is with pleasure that I share with you an awesome review of the first book in the My Alien Romance series by Magan Vernon. The wonderful Meredith Johnson of Meredith’s Musings suffers with Alien Lust like the rest of us, and bravely submitted herself to read and review these books for your Alien loving pleasure. Gorgeous Alien, Green Goo, and Guyliner! I’ m on a total alien binge, so when I heard about this book I couldn’ t wait to read it. I wasn’ t disappointed. It is funny, sweet, full of aliens, and Ace is just YUM! I have to say, the day before I started reading this I went to see the movie Monsters Vs. Aliens, so I couldn’ t stop picturing B.O.B, Dr. Cockroach and crew hanging around and giving a few high fives. I love how this story drips in sci-fi, but doesn’ t take itself too seriously. Some of the aliens are bizarre and the interaction between the different species is fun. Meet Alex Bianchi, a somewhat geeky over-achiever that needs something on her Columbia application to help her stand out. Extra curricular activities aren’ t her thing, so thank goodness her dad works for the ultra-secretive government compound called Circe. Just mentioning an internship there gets the Columbia recruiter to perk up. One call to Alex’ s estranged father and a summer at Circe awaits. 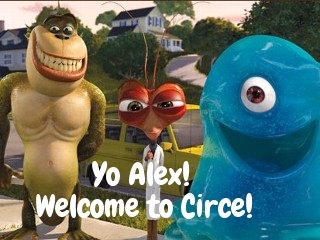 Only Circe isn’ t the military base Alex expected. It’ s actually a huge compound, hidden in a mountain where aliens are housed. What the what? (Sorry, I’ ve been dying to use that.) Leave it to poor Alex to give her dad the thumbs up the moment she steps inside the foreign little world, a sign that one should apparently never give in front of an alien. Just ask Alex as she’ s nearly strangled to death by some slimy creature. But something or someone with gorgeous black eyes rescues her. The next thing she knows, she’ s being treated by the Bug Man-a.k.a. an alien doc who I imagine looking like an orange roach (see Dr. Cockroach above). Alex struggles to fit in with the rest of the interns. While she’ s still in high school, they’ re all in college and one in particular is angry that Alex only got the much sought after position thanks to her well-respected dad. Whatever, Alex has more important things to do, like report to her assignment in online security! Hello Ace! Best. Internship. Ever. Alex can’ t help but notice her gorgeous supervisor, I mean hello guyliner! 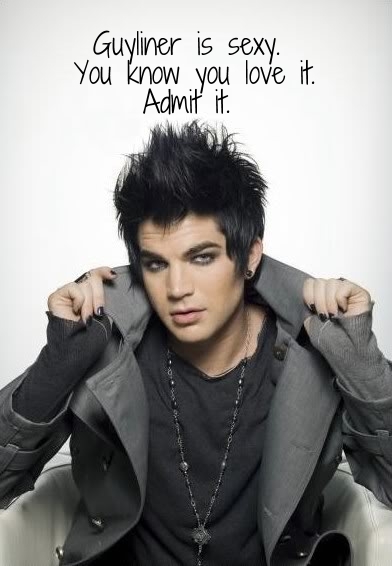 What is guyliner you ask? But those eyes, she’ s seen those eyes before. And boy do those eyes follow her everywhere. Such as into the cafeteria where Alex almost become a punching bag for an alien smack-down. But thankfully those black orbs swoop in and save her. Wait! That isn’ t the first time! Those black eyes that swallow her up saved her once before, the first day she arrived at Circe. Coincidence? I think not. Alex and Ace dance around their growing attraction, after all humans and aliens don’ t mix. But what if they do? Well, there’ s a few things about Ace Alex isn’ t aware of and let’ s just say falling in love with him could lead to the total annihilation of Earth. WHAT?!? Bring on the mother ship, mix in some green goo I want to dive in to, and let the shenanigans begin. My only gripe with the story is it’ s too short. I wanted more! I wanted more interaction with Alex and the other interns. By the end of the book we’ re supposed to believe that a few of these guys are willing to go way out on a limb for her. I just didn’ t see it. It was like the friendship developed some behind the scenes. I also had a hard time believing Alex could just jump into a spaceship and pilot it into outer space all by herself. I know, I realize the whole bug aliens and green goo I had no problem with, but seriously how can the chick just jump inside a flying saucer and become an instant Maverick? I still remember the first time I attempted to drive a stick shift. Let’ s just say rolling half a mile down a hill backwards, into a ditch, with a screaming mother trying to jerk the steering wheel were involved. Maybe it’ s just jealousy talking, but still. She was a computer nerd, it would have been more believable if she cracked some secret code and beamed herself aboard the mother ship. Just sayin’. Overall this is a fun, quirky read. If you love aliens I’ m sure you will enjoy the humorous sci-fi elements and the swoon-worthy Ace. I read this book in a day and quickly jumped into the next two in the series. It’ s addicting. On a side note, as I’ m writing this the news is reporting of a possible UFO landing in Boca Raton. Ace? I’ m here! Beam me up baby! Stay tuned for Meredith’s reviews of the other books in this series, an interview with Magan herself, and the chance to ENTER TO WIN signed copies of the books! I’m a reader, a writer, and an intern! I love everything publishing and wish I could put a book in the hands of every child! I look forward to reviewing books and helping writers find new, useful information. Oh, and I keep track of all FREE writing contests! Thanks for having me ladies! I’m starting a GUYLINER fanclub 😉 Seriously people, go get this book. Really fun, hot alien series! Dude. I flippin’ LOVE this review!